Yet another interesting day at “Ceci n’est pas” – the art installation at Gammel Torv by the Dutch artist Dries Verhoeven. Still more people come to visit or revisit the art installation with a friend. Today’s topic makes many people check the bulletproof glass of the box. The day begins with an apology from a man. He visited the box yesterday and he was jumping up and down knocking really hard on the window where the woman was siting with her drinks. He was trying to get the attention from the audience for some reason by saying he was the artist behind it, and that they should look at him instead. Today he will try to be calmer, he says. When the shutters go up a man is sitting on a carpet with at string of beads in his hand. A loudspeaker is hanging down from the ceiling. As he counts the beads he is saying something that the audience cannot hear. Only the sound from each bead can be heard on the metallic floor. He looks concentrated. He has taken off his shoes and wears a blue tunic and a black vest. “Why is he wearing a bulletproof vest? Or “is it an explosive belt?”. These are some of the questions that kick-starts today’s discussions. A Danish young couple are looking at the man praying in the box. As they read the text one of them explain that it is about our imaginary fear. People are approaching the box with a serious look on their faces. 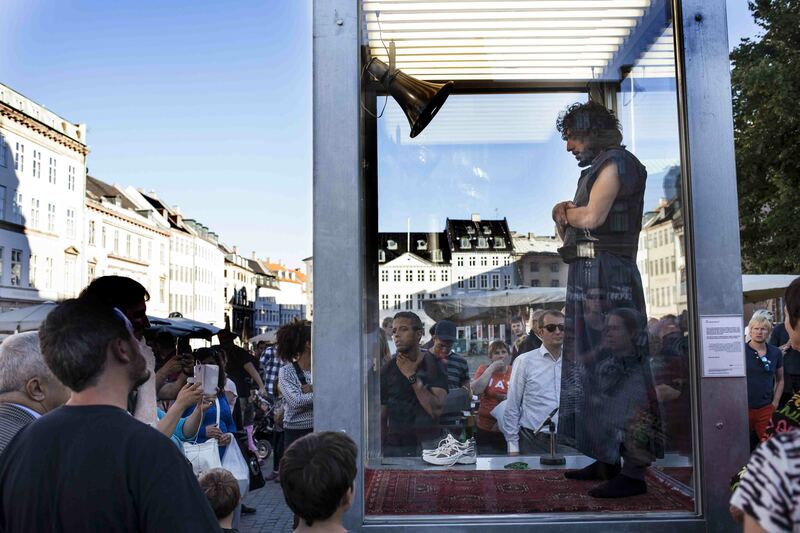 An elderly Danish couple pass the glass box without stopping: “Come on!”, the woman says to her husband. Two Danish men act the similar way: “Hallo, keep walking!”, one of them is saying to the other. A Danish group of two elderly women and a man are also in a hurry. When one of the women stops to take closer look at the installation, the other woman comes to take her with her. They leave. Two elderly Danish ladies go: ”Is it Jesus counting something?” They come a bit closer, but the other lady say:”Come on!”. They leave. Some Danish families have arrived at Gammel Torv. A mother explains to her child that it is Muslim praying to his god Allah. Like they pray to God. A father tells his daughter that this picture means that there is nothing to be afraid of. Many Danish Muslims and tourist stop to take a closer look and to discuss what they see. A group of Muslim young women express how they perceive this picture: “I see a man praying and I understand the message as you should not be afraid of this religion. Everyone should be accepted.” A lady arrives and asks them about where the girls are from. They change into another language, Arabic perhaps, as they discuss and point at the installation and the man inside. The sound of the muezzin’s call streams out of the box and is heard from a distance. This is not a sound that normally you hear in Denmark. This attracts more people, for instance a mother wearing a veil and her child. They stand in the crowd as the man turns his head and looks strait into her eyes with a calm and mild look. They keep eye contact for a while and the mother starts to weep. The man in the box gets up, opens his hands and cross them at his stomach. He falls down to his knees and put his forehead to the floor. He repeats it several times. A group of young men arrive and discuss, why he is wearing a vest. In the beginning in Danish then in Arabic, possibly. They walk away and look at the crowd from a distance, but after a while they return to see the next round (the shutter go up and down once in a while). In front of the box they start talking to a Danish young couple: “What is it about?”. The couple has been visiting the installation several days: ”It is about showing the thing that we are unfamiliar with. Or things that we fear.” A group of Danish Muslims girls arrives. They discuss whether they like the installation or not. One of them is pointing out several things that don’t match a real prayer, according to her. And it is not right to expose religion in this way, especially not when he is wearing the vest. It gives associations to terrorism. A Danish Muslim man returns after a quick view and a statement “nonsense”. This time he walks in in front of the audience and speaks out loud: ”He is not a real Muslim – he doesn’t looks towards Mecca. He is nasty!” He leaves while as the rest stays. Two Danish men originally from Syria find the installation quite interesting and they think it is a good way to show that there is nothing to fear. When the shutters go up for the last time this evening the man inside the box is lying still on his carpet. The muezzin is heard again. More people come to see what is going on. Some young men check out bulletproof glass of the box. They have a serious look in their faces when the shutters go down. Fear is a defence mechanism. When there are worrying signs, the amygdala regulates the secretion of stress hormones. In this way, the body prepares itself to fight or to flee. The focus shifts to the threat, and superfluous details are no longer perceived. When the threatening situation appears too great, humans retreat to familiar ground. Since 2001, the need for a familiar structure has led to an increase in orthodox believers as well as fear of foreign religions. Frygt er en forsvarsmekanisme. Når der er situationer, der bekymrer os, reg- ulerer amygdala udskillelsen af stresshormoner. Således forbereder kroppen sig på at kæmpe eller flygte. Fokus skifter til truslen, og overflødige detaljer opfanges ikke længere. Når den truende situation fremstår uoverkommelig, søger mennesket mod det velkendte. Siden 2001 har behovet for velkendte strukturer medført en stigning i antal- let af ortodokse troende så vel som øget frygt for fremmede religioner.